Technical information: BPR Ground Material. 6 Basic maps: Diffuse, Spec, Normal, Displaycement, AO, Gloss. Size: HD 4K (4096 x 4096). Seamless (tileable). Uses information: With 6 basic maps and seamless feature (tileable), you can use this textures for all materials. 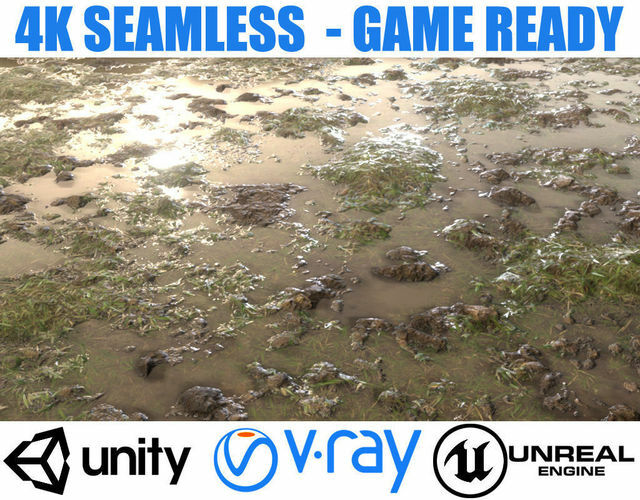 You can use them for real-time game projects, or as materials for exterior scenes, natural environments etc... With repeatable features, you fully master any size of the scene. HD 4096 x 4096 is perfectly suited for high quality projects. Take a look at the Sketchfab link attached for a detailed view. Very pleased if this product is useful for your work. Where is the sketchfab link you mentioned? Its a very good texture.